When did “no” start to mean, “wear me down with your relentless asking, whining, and evolving critical skill thinking that is so impressive it forces me to say, yes”? This is called “Orangie”. Yes it is. Maybe you’re still saying, um no, kim, what IS that?! 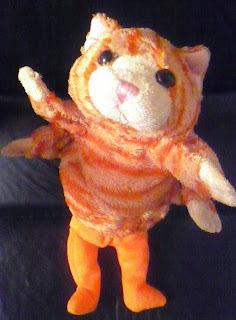 OK…it’s a cat puppet, that has a monkey, (or a bear, depending on the day) stuck up inside it so it has legs. But WAIT, you say, it already HAS legs, four of them in fact! Yes. I know. And Audge brings Orangie everywhere, and brings fear into all who encounter it. 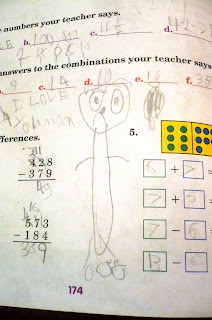 This is what happens when you leave your 8-year-old to finish his math on his own. This is what happens when you tell your son he has 10 minutes to finish before his Gameboy is taken away. yay for your hubs! Orangie is quite ... um interesting! well. you know i'm already a fan of that vardeo. man. i totally didn't catch that "i love you mom" in the first pic. that was good. why does audge make orangie eat things thru it's bottom? that's disedstrubing. mayerjorly. if you didn't break the elliptical, who did? the lady with the bouncy house? watch out! i just beckoned big brother. *wipes eyes* phew, that video..."you need a tan"
I did not eat blueberry pie, but something akin to your malady has struck my innards. Why is it then when I have to *go* at work, all my coworkers congregate near the bathroom? Why is it that there is a two inch space between the bathroom door and the floor? Why is bathroom spray so noisy? I might as well be shouting "I just pooped, everyone, and it was a doozy!" Why do I have nothing to blog? Also, I heard that mermaids are the new vampires. 1. I would love to see the third eye, Eegor. 4. I am impressed by your drive (not to mention your jiggles). 5. Since the beginning of motherhood. 6. Can't wait to hear about her pet toilet roll. Gheesh, will you buy that kid some toys, already? (Use the money you spend on blueberries). 7. Great, now I am going to have nightmares about an unidentified orange bi-bred animal with 4 legs that look like 4 arms. And, he looks like he has hip dysplagia or love handles too. 8. I can teach them how to spell swear words, it takes up less room on the page. 9. Now that is an accomplishment to be proud of. So this definitely means he is gettng a little sumpin-sumpin from you to show him just how proud you really are, right? Congrats to your hubbs! What an accomplishment! I loooove that video! LOL! wow. orangie. i carried around a stuffed papa smurf for a few years. i came across him in storage the other day and was walking around smiling and crying for about an hour. we went thru a lot together....me and papa smurf. LOL Love the entire post, but the homework cracked me up! Alright to your Husband!! What an accomplishment! 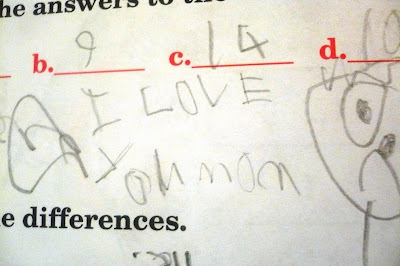 I love the boy's finished homework. I would totally be smiling with that result! Hey sweet thing! I LOVE your blog so much I gave you an award! Come check it out! It's on my blog! Would you tell me what zit cream it eliminating the whopper doozer zit? I've got one gurgling at the top of my forehead; a horn, if you will. Hey all thanks for your comments gals, I love 'em! Lynn, it's called Acnomel, you can get it at Rite Aid; fantastic reviews and it is working great for me! !